Gangi village in Tehri district getting electricity through solar power. 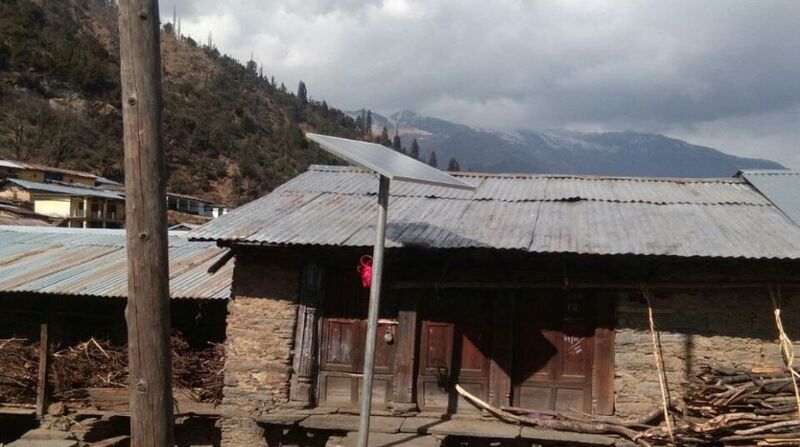 The residents of Gangi, a remote village in Uttarakhand’s Tehri district, were thrilled when they got electricity through solar power recently. As connecting the village through grid was not possible, the alternative energy method was used. Uttarakhand government’s Secretary (Energy) Radhika Jha said, “The villagers were overjoyed at getting solar power.” Not many take the trouble of touring Gangi. The journey is tough and long. One can reach the village by walking about 13 km. Till recently the Gangi villagers had to trek 22 km from Ghuttu. But, some 4-5 years back the distance got reduced by 9 km with the motorable road reaching Rei. The power corporation team had to carry solar panels and other accessories on mules to the village. Besides providing solar lights to homes, street lights were also installed to light up this remote village of Uttarakhand. The economy of the village is based on farming and animal husbandry. Not many youths opt for salaried jobs. The recent development has injected hope among villagers to get modern facilities soon.